Honor for All President Thomas Mahany and Vice President Kent Hall in Williamston after sharing their stories and speaking about the group. Honor for All, a non-profit organization with roots in Williamston seeking to erase the stigma surrounding post-traumatic stress, has made national strides in bringing awareness to the damage of recognizing this condition as a weakness and disorder. Thomas Mahany, Honor for All president and Vietnam veteran, elaborated on how eliminating the word disorder from descriptions of post-traumatic stress will be significant. Mahany founded the group in 2009 following a 29-day hunger strike to raise awareness for PTSI and suicide. At this time, the military’s Stop Loss program allowed for the constant redeployment of veterans and pushed the effects of PTSI to a high. “You can only beat a guy up so many times before he can’t fight anymore,” said Mahany. Since then, he has successfully convinced 39 states to recognize the change from PTSD to PTSI. Michigan was the first state to make the change in 2014. 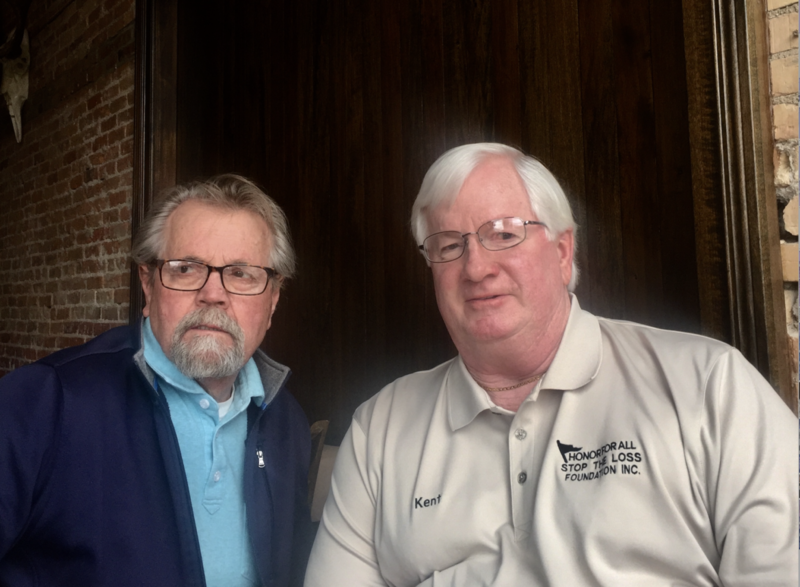 “We want to educate, we want awareness, and we want to reduce the stigma that’s a part of the reason we have so many suicides,” said Kent Hall, Honor for All vice president, Williamston city councilman and Vietnam veteran. According to the U.S. Department of Veteran Affairs, PTSI rates in veterans range from 11 to 20 percent of those who served in Iraq and Afghanistan and up to 30 percent of Vietnam veterans. Among these, about 92 percent of the five million veterans receiving care go undiagnosed, left with no treatment or explanation for how they feel. Further, 20 to 22 veterans, on average, will die by suicide each day. Honor for All recognizes these statistics and seeks to combat them by honoring those lost to suicide following war. They likewise hope combating the stigma of PTSI as a weakness or disorder may increase the use of available help. “For every day there’s 20 veterans, there’s also two firemen and one policeman—that’s not even counting victims of crime and sexual abuse. It’s a big deal when you come down to it and that use of the word disorder, it’s not helping people, it’s killing people,” said Mahany. Hall hopes to use his own experience with the effects of PTSI to lend a hand so that fellow veterans seek professional help. In high school, Hall was an accomplished pole vaulter and member of the track and baseball teams. “Life was good,” said Hall. Prior to his deployment, he hoped to attend college and learn to educate others in the sports he loved. Coming back from the war, his plans changed as his untreated PTSI left him unable to stay on the same path. In the 1980s, Hall attempted suicide by cop, having no explanation or treatment for how he had been feeling post-war. He now meets with a group of 12 veterans twice a month as a form of group therapy, though the fear of the stigma surrounding PTSI still leaves many other veterans untreated. In Williamston, the group seeks funding for the Honor for All River Trail across Memorial Park, featuring a memorial on Scout Island to honor veterans and first responders lost to the invisible wounds of war and life, including PTSI and traumatic brain injury. Tammy Gilroy, mayor of Williamston, underscored this, saying Honor for All has worked hard to provide this space in Williamston to honor those lost to PTSI in any walk of life, including the family members impacted by the condition. Williamston resident, Daniel Richardson, said he has heard of the efforts of the group in Williamston and hopes it will continue to raise funds for projects. In 2018, Honor for All raised more than $12,000 to bring the American Veteran Travel Vietnam Wall to Williamston. This wall is an 80 percent scale replica of the Vietnam War Memorial in Washington D.C. and features the names of more than 58,000 military personnel lost in the Vietnam War. Working with Honor for All, the ultimate goal is to help others recognize that PTSI is not a weakness that should destroy them, but rather a wound that may be healed with help and support. Having this safe space in Williamston to honor those lost, they hope, will be one step further in the process of healing. Emily Bevard is a journalism sophomore at Michigan State University, pursuing a minor in public relations. She is currently a member of MSU's Red Cedar Review literary magazine as well as the university's creative writing club. Moving forward, she hopes to delve further into the world of reporting and to transform her passion for storytelling into a career.